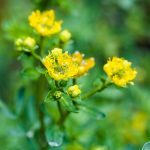 Ruta graveolens, known more commonly as rue, common rue or herb-of-grace is a native to the Balkans. Essentially a garden plant, it is also grown for its medicinal qualities. It is also cultivated as a condiment, and as an insect repellent. Rue was used widely earlier and found several mentions in ‘Old English Herbals’, a famous book about herbs and plants written by Eleanour Sinclair Rohde. But gradually, its usage declined due to its toxicity and bitter taste. Rue was mostly used for its antibacterial, antiviral, anti-inflammatory and anti-oxidant properties. This rue herb plant has a special place in European folk medicine and is still used widely. 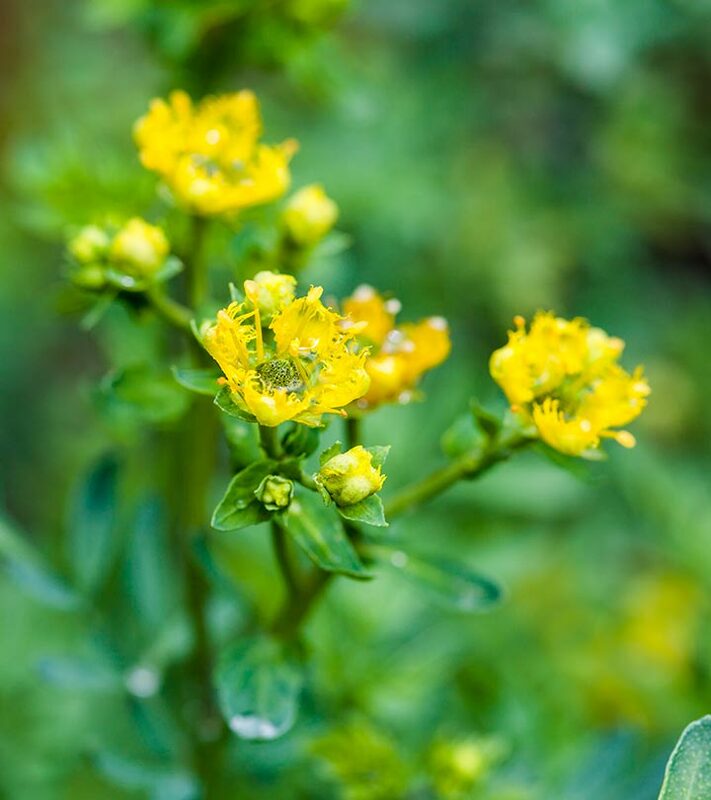 According to the “Natural Medicines Comprehensive Database,” Ruta gravealens or rue contains alkaloids, which have anti-inflammatory, antispasmodic, anti-fertility and antihistamine properties. Rue also contains a plant compound called rutin, which is an antioxidant that helps prevent free radical damage. Rue helps our body fight against fungal infections such as dermatitis and athletes’ foot. Depending on the severity of the infection, rue can be used directly on the skin, especially when one is suffering from athletes’ foot. It also provides instant relief from itchy skin. The anti-fungal properties of rue also helps it to cure de-complexion of the skin, to reveal a more beautiful and clear skin.The anti-oxidant properties of rue ensures that your skin wards off free radicals that cause premature ageing of the skin, keeping your skin looking young and happy. This is why rue oil is often used in spas for providing therapeutic facial steams. Being an effective insecticide, rue essential oil and extracts are often used to get rid of a lice infestation. Regular use of this oil can repel those pesky little parasites from your hair and help you stay itch free! A number of spas use rue oil for hair treatment, to give you hair that shines with health. This is the perfect recipe for healing damaged hair. Rue is effective in calming hysteric and epileptic attacks due to its sedative properties. It helps in desensitizing and relaxing the nerves while inducing numbness because of its neurotoxin content. Pests like mosquitoes, cockroaches and flies cause a number disease. These insects can be driven away with the use of Rue. It can also be used as vaporizers, fumigants, incense sticks and burners in-order to ward off insects. Rue protects us from bacterial infections by killing bacteria with its anti-bacterial properties. It can be used in the preparation of tea to fight urinary tract, intestine, and colon infections. It also protects us from food poisoning and salmonella. If you suffer from muscle pain, you can try rue. It is an excellent remedy for muscle pain, anxiety and menstrual cramps. Rue can reduce inflammation mainly caused by arthritis. Regular intake of 1-2 cups of rue herb tea helps in easing stiff muscles and relieves joint pains. Rue is known as an intidote to poison. It is highly effective on neurotoxins (E.g. : Snake bite, insect bite which are neurotoxin) but it cannot show any effect of haemotoxins. It can cause severe damage to the liver and kidneys. People with kidney/liver problems must not use any medicine/food related to rue. If people with stomach and intestinal problems such as colitis or ulcers or inflammatory bowel disease consume rue, it can worsen the problem. Pregnant women must avoid rue in all its forms as it can cause miscarriage. Rue can be used for abortion but it can have serious effects on a woman’s health and can even lead to death. No wonder that rue’s use has nose dived in the recent years. But if one is careful, and follows the prescription of a doctor, rue can still be used to get relief from several health conditions. Never self medicate with rue. Always consult your doctor before using this herb. Hope you found this article helpful. Do write back to us in the comments section below.